It looks like the Lucky charms leprechaun ran out of luck or he just can't hold his liquor that well anymore. 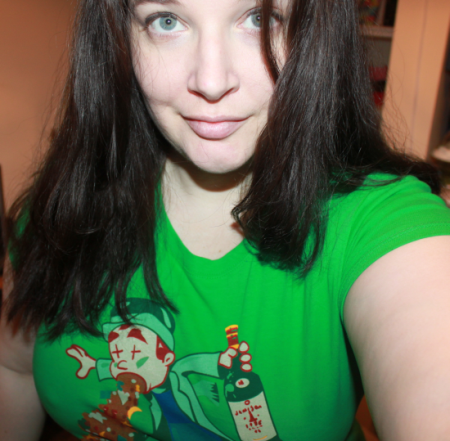 I took one look at this shirt from the St Patricks Day T-shirt website and had to have it. I'm not really sure why, but I found it hilarious that evidently the innocent leprechaun isn't as innocent as we all thought. Poor thing is spewing up last nights St. Patty's party. I bet those lucky charms don't taste as magically delicious coming up. Is this something to wear to a family get together? No. Is it something to wear for fun or to a party? Definitely. There's a really good chance you'll be the only sporting this where ever you go. This t-shirt is made awesome. The quality is akin to something you might find from AA. It's very soft and I chose the Women's fit to review, which is fitted like a baby doll. What's great about this shirt is that it comes in plus size. It's rare you find a baby doll shirt in true plus size, and it has quite a bit of stretch. The image isn't stretched out across my chest rendered illegible. Ehem. The screen print is nice and quality and the green is vibrant. I'm impressed with this T-shirt, especially for $18.99. This t-shirt comes in Women's and Men's in different colors and sizes past XL. Check out more of what they have to offer, because there's a ton of t-shirts just as funny as this one.